O.k. so I have a lot more to post about our trip to CA, but I have to fit this in while it’s on my mind, I started to let everyone know about my 50 year old brother, Pat’s latest adventure then never got back to it. So here’s the scoop. 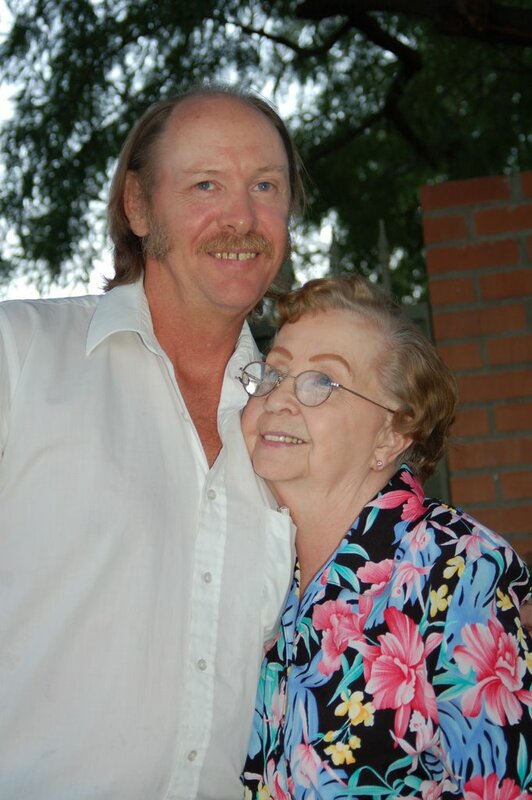 Pat left Phoenix on August 31st, drove a rental van to Corpus Christi, TX, dropped off the car and started out on a bicycle trip from Corpus Christi to Fort Myers, FL. 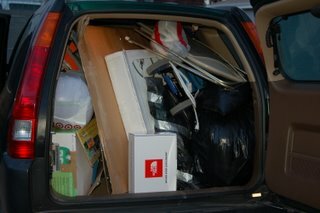 This is a picture of all the stuff he was taking with him, including his bike, in the back of our car. You’ll notice a few extra items, like a folding chair that we brought to our house, but 99% of this stuff he was going to try to fit in a little trailer behind his bike, a backpack and a couple of saddle bags. Who knows if he actually fit it all in. This next photo is Pat with our mom just a few days before he left. She’ll be doing a lot of worrying over the next few months! But it isn’t the first time that he’s gone on a major adventure and it probably won’t be the last. Based on my very rough calculations Pat will ride well over 1300 miles. If he averages 40 miles a day, (he says his range is 30-50) his trip should take about 40 days. He started from Corpus Christi on September 2nd so we are now at day 17 and here’s his status. He called this morning to let me know that he’s in Sulphur, LA which is at least 350 miles by interstate from his starting point. Now understand that he can’t go on the interstate freeways with a bike, so he has to travel on state highways and surface streets…so let’s add another 100 miles to his route just to be safe. If you do the math, right now he’s only making about 26.5 miles a day. If he keeps up this pace, it will take him about 53 days. If you watch the national weather at all, you know that he’s been getting rain off and on the whole time. Of course, we warned him many many times that it was hurricane season, but he wanted to do it now anyway. We’re just praying that he just gets rain and no hurricanes. Another point that will help you understand Pat. He was in a motorcycle accident (riding without a helmet- don’t EVER do that!) when he was in his late 20’s and had severe head injuries. He can function o.k. in daily life, but many of what we all have as normal manageable weaknesses are more extreme with Pat. He gets frustrated easily, he gets confused and lost easily, he tends to be paranoid and not trust people. He’s very stubborn and always thinks he’s right and knows everything about everything. He doesn’t understand or trust computers or much new technology. He does own a cell phone – Thank you God! Imagine what this does to his situation when he’s riding across the country in strange places with strange people and hard to follow directions. So is he extremely brave or just plain crazy? Probably a little of both. He’s probably better discribed as a wanderer…never really being able to settle his soul long enough to feel at home. He really wants to have companionship and feel loved, but has a hard time getting along with people because of the issues I mentioned before. He needs someone who can be patient, but even his own family gets frustrated with him at times. When he called this morning the first thing he said was, “Hi sis, guess what? I’m lost!” He had been wandering around in this small town of Sulphur not far from the border of Texas and Louisiana for two days trying to find a specific highway that he could see on his map but couldn’t manage to find in real life. He said his map was falling apart because he had taken it out so many times in the rain that he couldn’t even look things up any more. He said he had gotten directions from 4 different people and had been to every part of town that he could imagine, but still couldn’t find the highway. He was starting to believe that the people were giving him wrong directions on purpose (there’s that paranoia again). I assured him that they wouldn’t do that, and while I had him on the phone I looked up the town on Yahoo Maps (What did we do before online mapping?) and helped him figure out where we thought he was and where he needed to go to get out of town. Fortunately, he called later in the day and left a message that he had found the road he was looking for and finally escaped the clutches of Sulphur, Louisiana…NEXT STOP – Layfayette, I think. These next days are probably going to get more difficult as he gets into the areas harder hit by Katrina. He was already planning to swing north of New Orleans since there is so much devastation there. I just hope he goes far enough north to be able to actually find the roads that he needs to still be intact. So keep Pat in your prayers for protection and safety, some decent food and a good night’s sleep…and maybe even to meet some friendly people that he can enjoy along the way. Be sure to keep us ‘posted’ on Pat… I know… a “Weekly Pat Posting”!We would all love to feel a part of His adventure… very inspiring!I will be praying for him.